A perfect carpet cleaning package for the professional cleaner, as well as the home owner. Comes with an extractor, an air mover, and a FREE case of carpet cleaning chemicals. The concentrated case of chemicals will fill the extractor about 10 times for continuous shampoo carpet cleaning. Comes with a lifetime warranty on the tanks, and 2 years on parts and labor. Our CleanFreak® spot cleaning machine is the perfect compact spotter/extractor for small spills and stains as well as auto detailing. 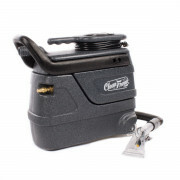 The 55 PSI pump safely applies solution to stains and soils on both carpet and upholstery. We offer a complete carpet spot & stain removal guide for use in the field to remove different stains based on the stain's make-up. For other more economical models, please take a look at our full line of portable carpet spotters. 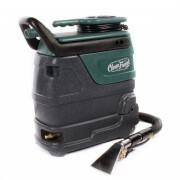 With this CleanFreak® heated spot cleaning machine, you can efficiently spot clean large carpeted areas. The heat helps the solution break the bonds between the dirt and the carpet fibers to remove it quicker. We offer a complete carpet spot & stain removal guide for use in the field to remove different stains, as long as you can identify it. For other more economical models, please take a look at our full line of portable carpet spotters. Out of all the self-contained carpet extractors we have to offer, this unit is definitely the one that gives you the most bang for your buck! The "Pro-7" will dispense your solution, then scrub, and recover the solution all in one pass. 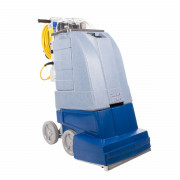 The 7 gallon solution and recovery tanks allow for you to clean large rooms easily, and efficiently. There is a full complement of accessories available, giving it maximum versatility to clean upholstery, stairs, and other hard to reach places.